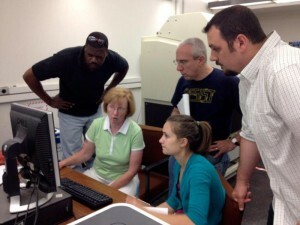 Team-RET provides middle school, high school and community college math and science teachers with an intense, six-week period of in-depth study at the CCMR laboratories with facility managers, faculty, and graduate students. In the Team-RET program, five select science teachers spend the first five weeks primarily in the CCMR Shared Facilities. They work together as a team to understand how the equipment in the facility works and to solve research problems set out by the facility manager. The sixth week is dedicated to developing a materials science related lesson plan based on their experience in the facilities. Copies of Team-RET alumni lesson plans can be found on our RET Modules page. We will also be offering an Independent-RET program this summer as well. This opportunity is only available to teachers who have completed the CCMR Team-RET program. For more information on the Team-RET and Independent-RET programs please see our RET FAQ’s page.